This year, though rapidly coming to an end, has been pretty exciting for those of us whom are passionate about premium motorcycles. We’ve seen some rather significant debuts throughout the year, and as the new year approaches, too approaches the dates in which these motorcycles will be made available for purchase. Among the several bikes that BMW Motorrad is introducing to its 2017 lineup is the G 310 R. Two days ago, I had the opportunity to sit on the bike, as well as its primary rival the KTM 390 Duke, and to compare and contrast certain aspects of their build quality. I’ll start with the KTM, which has been updated and refreshed for the 2017 model year. Though its aesthetics have improved immensely, the bike was disappointing to say the least, in person. Having debuted at this year’s EICMA show in Milan, the new smallest Duke available here in the States seems to outclass the Beamer a bit, if one were simply comparing data on a sheet of paper. It has a larger power plant, more fuel capacity, and more torque. It’s larger engine means that it produces nearly 25% more horsepower than the BMW, but costs only hundreds more. However, upon initially mounting the bike, it became glaringly evident that excessive use of plastic had been a prevalent means of cost cutting for the Austrians. Chintz galore! Particularly perplexing and off putting were the rubber like guards used to cover the mirror stems. It wasn’t all bad, though. Many of the buttons had a great tactile feel, with good ergonomic placement. The pegs were topped with rubber which I found to be firmer and of better quality to other small displacement naked bikes, such as the Honda CB 300 F. In all, as the previous iteration of the bike was plagued with reliability issues, this left me with little confidence regarding the new 390 Duke’s prospective reliability. Then I went right over to the BMW. Upon initially mounting the bike, I was surprised, as I anticipated the bike to feel a bit lighter than it did. The seating position struck me as being more comfortable than the KTM. Still, did this new BMW, the first of which is being built outside of continental Europe, feel like it had been built to a different standard than the rest of its family? Well, a bit. The bike which I was sitting on was showing significant wear upon the throttle, as the material appeared to be of insufficient quality to cope with the constant use it had been enduring. The bike otherwise seemed to have many of the positive quality attributes of the KTM, and then some. Still, certain things, such as the material of the clutch and brake lever, felt less than premium to the touch. The bike is rather handsome, though in my opinion, the KTM is the better looking of the two. Clearly, neither bike can feel of comparable quality to their much more expensive, European built brethren and retain a price comparable to where they are currently. Yet, having also sat on the 2017 Kawasaki Ninja 300, I can say that neither felt to me to be as premium as the comparably priced Kawasaki. Part of what you’re paying for then is the brand name, and all of the social value that has. Though, as the KTM has previously suffered from reliability issues, and there are reports suggesting that BMW had to push back the G 310 R’s market launch due to issues, both brands could suffer in the long run from their desperation to sell downmarket. Of the two, head-to-head, which is how they will most likely be cross shopped, the Beamer felt to be of perceptibly better construction. Too, important to note for prospective buyers, BMW Motorrad has a far superior dealer and concomitant service infrastructure in the U.S., which should provide a bit more peace of mind. However, being that both of these bikes adorn premium brand names, don’t expect repairs to be cheap. 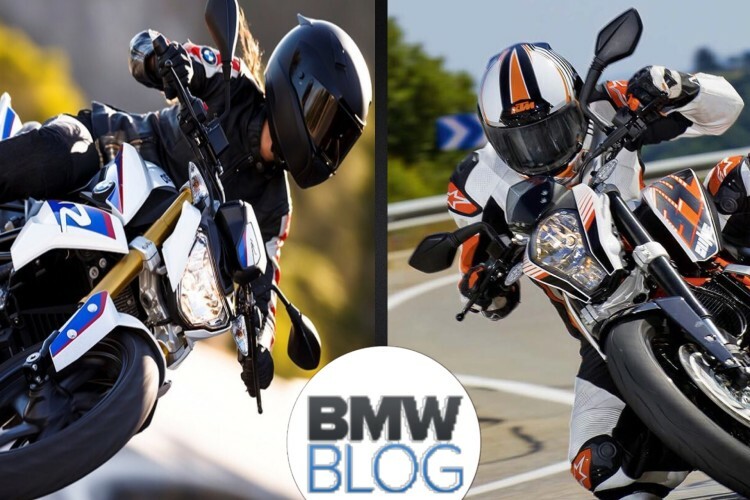 Overall, considering that this is merely a first impression, the BMW walks away from this head-to-head as the victor, though that could all change once the opportunity to test both bikes on the road presents itself. Next post BMW i3 – What’s up with tire life?